British artist Samuel Zealey explores physicality and materiality through his large-scale sculpture practice that is based on a love of physics and engineering. His work can currently be seen in two exhibitions in London but you need to be quick. 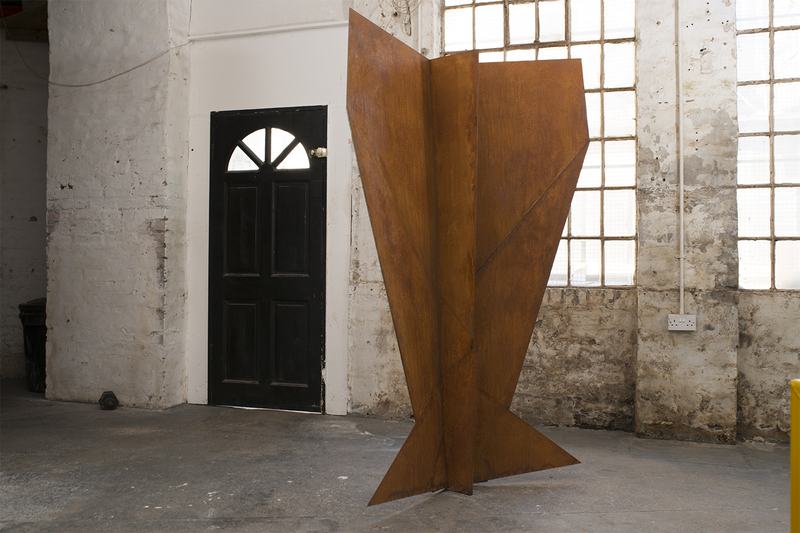 His solo show entitled Planes is on until 8th April 2017 at the Cob Gallery in Camden, and his work is part of a group exhibition at the Hackney Wick studio of fellow sculptor Luke Hart entitled Sculpture in Public (on until 2nd April 2017). 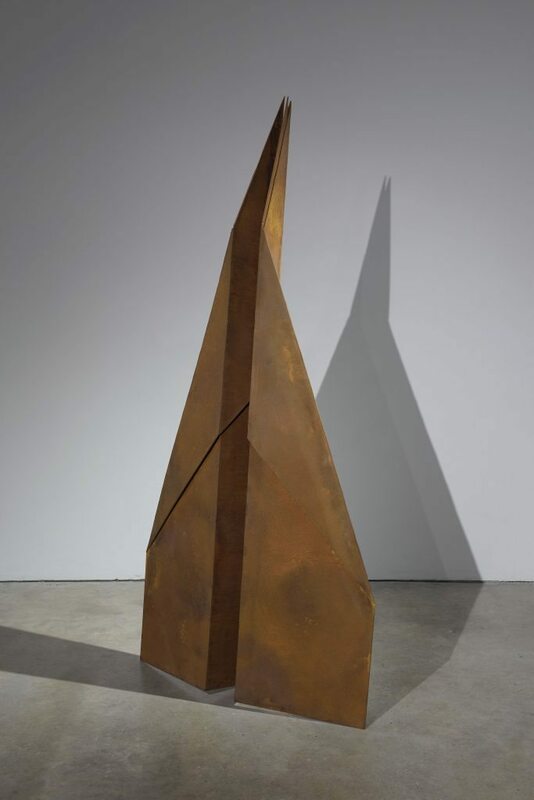 This group show questions the traditional idea of “public sculpture” and is a reprisal of an earlier group show in 2012 entitled Fabricators at the Hannah Barry Gallery, featuring the same five sculptors, James Balmforth, James Capper, Alex Chinneck, Luke Hart and Zealey. After 7th May 2017, you will be able to see a public sculpture by Zealey outside the Bracknell train station in Berkshire. Titled Onyo, the West African word for “precarious”, this four-metre tall sculpture consists of scaled-up Jenga bricks made from different materials that correspond to the historic timeline of technological advances in materials. Starting with the most humble materials on the bottom from the Stone Age (granite foundation boulder) and continuing up through the metallic stages corresponding to the Copper, Bronze, and Iron Ages and finishing off at the top with the more advanced metallic alloys such as aluminium, stainless steel and mirrored stainless steel, this leaning public sculpture will question the continuation of our civilization in its current form. Congrats on your solo show at Cob Gallery called Planes! You are showing your Folded Steel Plane Series, a humorous, tongue-in-cheek exploration of materiality, gravity and engineering. What is this series all about in your mind? What were your inspirations? This new body of work Planes reflects ideas I have always held important to my visual language, such as invention, form, weight, malleability, accessibility and pushing materials to their absolute limits through a scientific understanding and material intelligence. I have always considered myself a bit of a purist with respect to how I use and finish materials because there is such a stark and powerful beauty in the colours and textures of nature. This acceptance reflects much of my ethos with regards to my respect and love for this planet and the environment as a whole. Humanity should employ these virtues -- to become humble once again in life, and live in equilibrium within a system being destroyed by our very existence. For me, the Planes resemble a humble intelligence and understanding of basic aviation and flight, which is learnt from a young age. Usually, a folding technique is nurtured by a loved one whereby a particular style of plane is repeated over and over again. This act becomes a type of muscle memory. These Planes are as much about nostalgia as they are about the future. They hold a timeless aesthetic as a static relic and homage to the power of one’s mind; be it young or old, these objects are relatable and accessible to every culture of the world. These Planes are a symbol of human unity. I initially saw your work back in 2012 at the Fabricators exhibition that sculptor James Capper curated at the Hannah Barry Gallery in London and was blown away by your infatuation with physics, engineering and new technologies. This show took place shortly after you graduated from the RCA. How has your practice developed since then? 2012 was when I focused on the theory side of my practice. I wrote an essay about the rules within my work which I called The Matriarch and I; this text is the foundation of my current practice. From a young age, I have always been fascinated by many different philosophies, but I have always been particularly inspired by physics, which is heavily apparent in all of my work. The Integrate of Fertility, shown first at the Hannah Barry Gallery in the group exhibition Fabricators, was a huge breakthrough in my sculpture practice and a catalyst to where I am now. This piece brought together my love for science, form, weight, balance, nature, environment and art into one static moment of time. I learnt from this piece that I am mostly interested in the potential of energy and the beauty in stillness and how to make this a physical form which demonstrates the elusive. I have pursued timelessness and learned to be subtle yet loud and never to force the issue because this can destroy a piece very easily. My goal has been to make a sophisticated, thought-provoking visual language that looks effortless and grounded, yet cutting edge and dynamic. 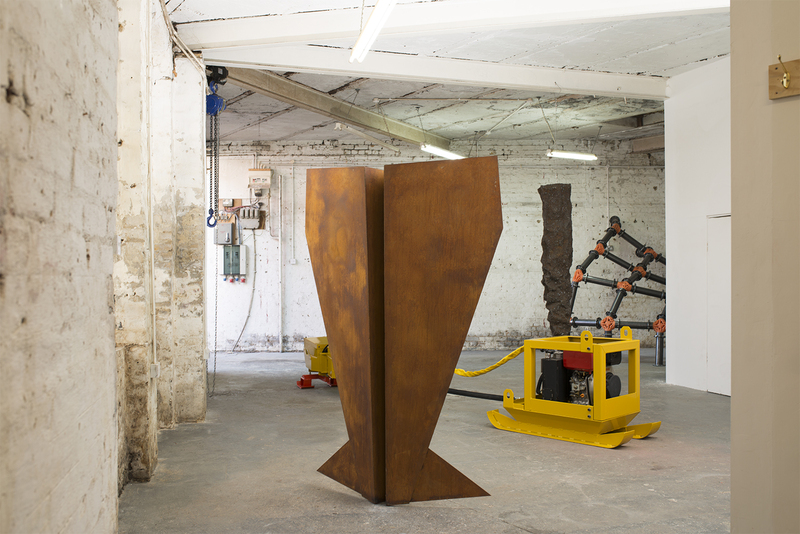 Tell me about Sculpture in Public, the group exhibition of sculptures by five artists in the Hackney Wick studio of sculptor Luke Hart. What did you make for the show? How did this show come about? Luke Hart recently found out that he would be losing the Hackney Wick workshop that he has been resident in for the past eight years in April. Instead of being defeated by this situation, Luke decided to make good out of a bad situation and proposed to James Balmforth, James Capper, Alex Chinneck and me to put on a group exhibition, transforming his old studio briefly into a warehouse style exhibition space for the show entitled Sculpture In Public curated by Luke Hart and George Marsh of William Benington Gallery. Most of the artists involved in this exhibition took part in the Fabricators exhibition back in 2012 at the Hannah Barry Gallery so we knew, as a collective, our sculptures worked well in a space together. We all see the importance of making ambitious thought-provoking large-scale sculpture that poses questions about ideas around “public art” and how to push these ideas to new levels. I think I speak for us all when I say that the ideas which are inherent to public art are dated, stagnant and, in some cases, boring, so we are all trying to purposefully redevelop the foundations of what public sculpture should be and can be. This show echoes this ethos. For this exhibition, I developed the sculpture Cross Wing which is number five of the Folded Steel Plane Series. You have won two large public sculpture commissions over the last few years – one in Bracknell in Berkshire and another in Spitalfields in London. As a maker of large scale sculpture, is this the only way to survive as a sculptor in today’s art world? How does public sculpture differ from making work for a gallery exhibition? Personally I would say no. I make a lot more capital gain from my gallery practice than I do the public sculpture commissions I have won. This is because, in the most part, materials that are made to last outside are very expensive and a lot of public sculpture commission budgets are not fantastic. For my practice, it is probably something to do with how ambitious I am with regards to bending and breaking the rules because I want to challenge what public sculpture can be. Saying this, winning public sculpture commissions is a great way to grow as a sculptor and really appreciate the ins and outs of what sculpture is, what it can be and what you don't want it to be. Public sculpture gives one an edge and a sophistication with materials that might not have been possible without the commission. If anything, it’s just really good practice to take on large-scale projects because you learn to manage many different parts of a creative operation. I enjoy showing in galleries because it allows an artist to be really experimental, exciting and vibrant. The red tape disappears to an extent because health and safety is managed differently. It’s a lot easier to push the limits and challenge the gallery system as well as one’s practice within a gallery environment because an artist’s work is within a more controlled setting. Essentially, what I am saying is that there is a lot more freedom to be creative in the gallery environment. Your artist’s statement mentions your interest in the environment and your desire to find sculptural ways to combat global warming. Can you talk about this strand of your creative practice and how you have attempted to battle against these environmental issues affecting our world today? Many of my ideas that translate to visual culture are metaphors of ways that we could or should combat the problems humanity has posed upon this planet. For instance, the Bracknell Public Sculpture Commission Onyo is a statement about humanity’s neglect of the most important issues facing our kind in this current day and age. If we are not able to combat these problems that we have inflicted upon ourselves, our reality will inevitably topple. I also use sculpture as a vehicle to invent what some might consider in physics to be absurd. This is because the laws of the universe state it to be impossible but I believe that there could be an alternative working model that, in turn, could combat such things as global warming. These ideas are all works in progress. Being a sculptor seems like a difficult artist to be…. High production costs, reliance on fabricators, difficulty in luring collectors to buy three-dimensional work, finding places to display outdoor sculpture, etc. What advice would you give to a young artist training to be a sculptor at art school? If sculpture’s your medium, you have to believe blindly in your vision because it’s the hardest path in the visual arts to take and it’s all about stamina. As you have already stated, production costs are high, and collectors prefer, for the most part, to buy two-dimensional works. You can eliminate one logistical problem by cutting out the reliance on fabricators by becoming a fabricator yourself. This requires having a studio workshop fit for the sort of work you produce. Although setting up a large sculpture workshop is expensive at first, it becomes cost effective over time. I've found over the course of the last eight years that having a serious and effective sculpture workshop puts confidence in the minds of individuals that invest in the arts, such as collectors, because it shows how serious you are about your own practice. This confidence can lead to investments in an artist’s work, and good professional relationships can flourish. Another important aspect to remember is to always keep your dearest friends that make sculpture close because they will be the most loyal and supportive people in your life. They will pick you up when you're down, cheer for you when you are up, and give you the advice you need at anytime. Never be a shark, be a wolf! Samuel Zealey (b. 1986, London) is a sculptor who lives and works between London and Essex. 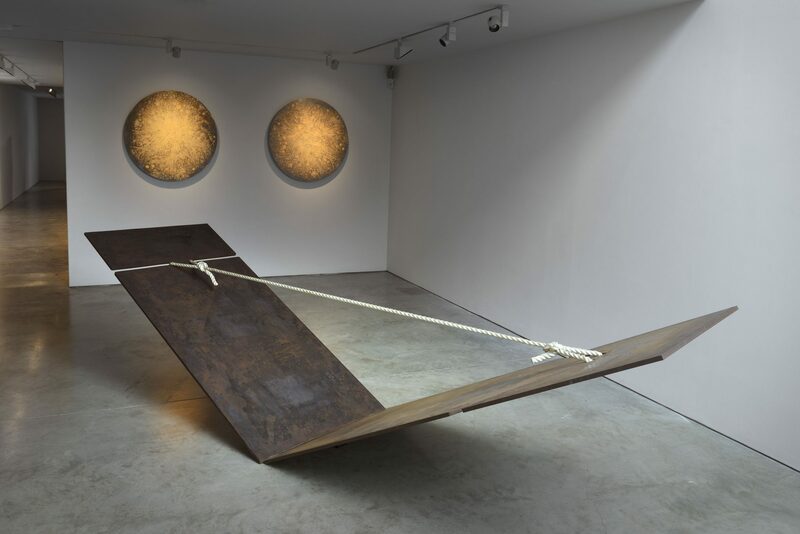 Since completing his MA at the Royal College of Art in 2012 under the tutelage of Richard Wentworth CBE, he has shown in group exhibitions including ‘Sculpture in Public’, William Benington Gallery London Projects, London (2017); ‘Fabricators’, Hannah Barry Gallery, London (2012); ‘Disappearance’, NAM Project, Milan (2013); ‘Sound Track Festival’, Geffrye Museum, London (2013). Solo exhibitions include those at Cob Gallery, London (March-April 2017); William Benington Gallery, London (2015); Merrymeade House, Brentwood, UK (2014); and Tim Sheward Projects, London (2013).. Zealey has won several awards including the Bracknell Public Sculpture Commission (2015) and the Spitalfields Public Sculpture Commission Award. His work is featured in the collections of Channel 4 John Nole Management, Bouke de Vries (patron of the Contemporary Art Society), the Museum of Mechanical Art & Design, Kinetica Museum and the Broomhill Sculpture Foundation. 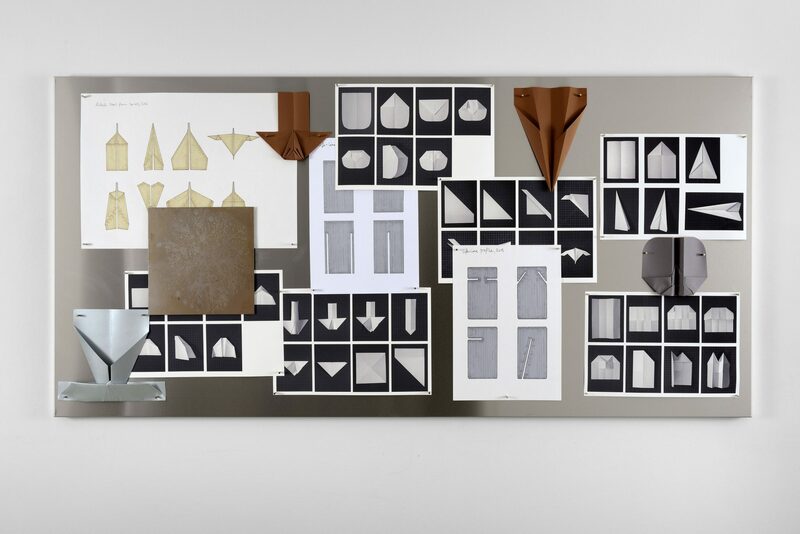 Samuel Zealey, installation views from Planes, Cob Gallery, London, 2017. Courtesy of the artist and Cob Gallery, London. 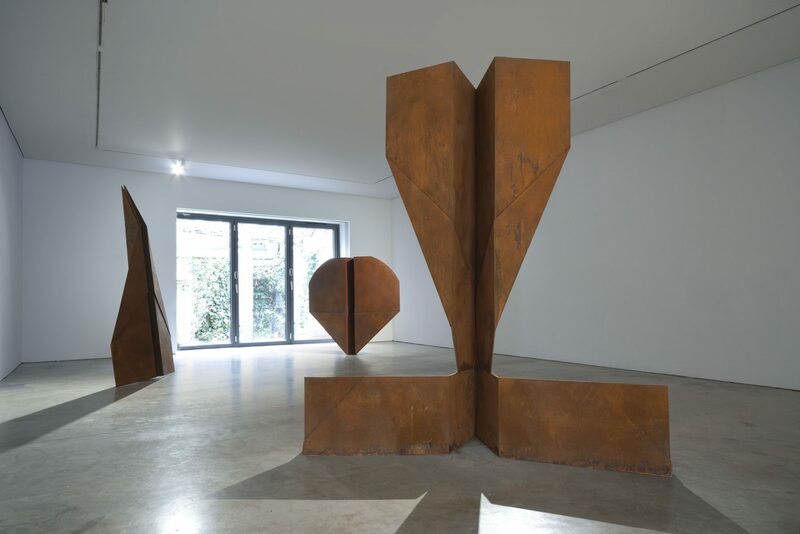 Samuel Zealey, installation views from Sculpture in Public, William Benington Gallery London Projects, London, 2017. Courtesy of the artist and William Benington Gallery. Photo: Nick Paton. Third image above features works by Samuel Zealey, James Capper, James Balmforth and Luke Hart.